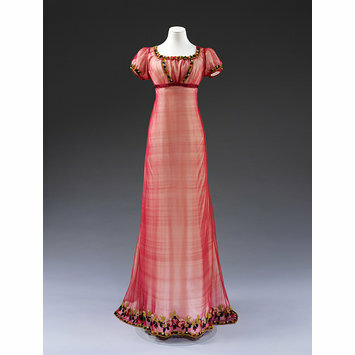 By 1810, brightly coloured and embroidered silks were as popular as white cotton and muslin for women's evening dresses. John Heathcote's bobbinet machine, patented in 1809, enabled fine net to be easily produced in wide widths for dresses, which could be hand-embroidered to achieve individual and attractive effects. Net dresses were worn with underdresses of plain silk, sometimes white, or in a matching colour. Chenille (French for caterpillar) is a type of thick thread made by a weaving process. Cotton or silk is woven into a length of cloth which is then cut into very narrow strips, the severed weft threads creating the tufts which give the yarn its velvety texture. The dense colour of chenille thread creates a contrasting effect with the ground fabric. Fashion leaders such as Empress Josephine, Napoleon's first wife, helped to popularise dresses of machine net, or 'tulle', which was also produced in France. She owned many machine-made net dresses embroidered with silver or gold metal thread and spangles for formal court occasions. 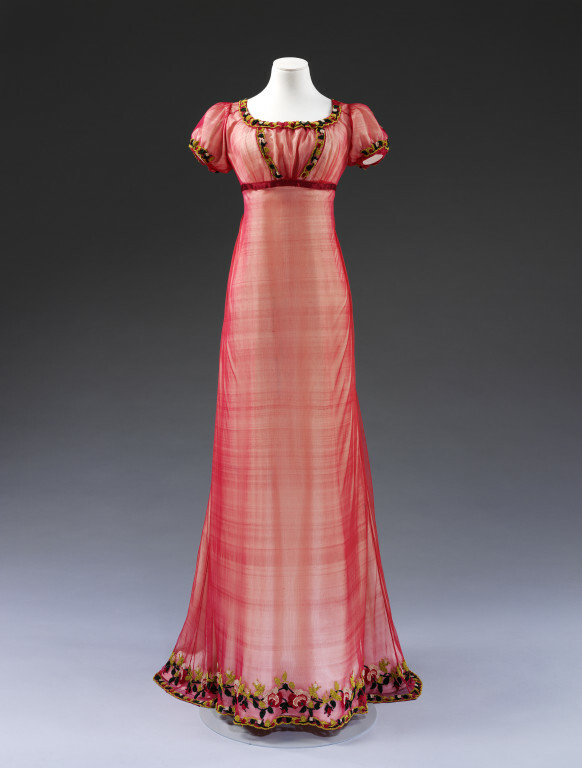 Dress of red silk machine-made net, with high waist, low neck and short, slightly gathered sleeves. The bodice is cut with side panels used on the cross, and fastens at the centre back with a narrow red silk ribbon at the waistline. The skirt is cut straight with additional fullness gathered at the centre back. It is hand stitched. The neckband and sleeves and a v-shaped insertion in the bodice front are embroidered with a design of rosebud garlands worked in pink, red and green chenille. This embroidery is repeated at the hem, with a wider trail of roses and rosebuds. Before the dress was donated, it apparently had a red under-dress which was not brought to the Museum because it was 'very perished'. Napoleon’s imperial court revived the etiquette of dress from before the Revolution. High-waisted gowns continued in vogue, using a variety of fabrics suited to the formality of different occasions. White muslin was worn in informal dress and lustrous silk for formal events. Machine-made net, or tulle, proved an ideal ground for hand-embroidery in contrasting silk, metal thread and spangles, or, as here, in tufted chenille thread. Tulle was a new product manufactured in England and France.